Yangon is the known as “Garden City of Asia” and is the main gateway to Myanmar. In 1755, King Alaungpaya founded the city on the site of a small settlement called Dagon. The name of Yangon means “End of Strife”. Yangon is filled with lush trees, shady parks, beautiful lakes, colourful markets and colonial heritage style buildings. The city centre always bustles with street vendors, trishaw and passenger buses, and a diversity of shops. The magnificent Shwedagon Pagoda; one of the wonders of the world, City Centre Sule Pagoda, ChaukHtatGyi Pagoda; the reclining Buddha Image, Colourful China Town, Botahtaung Pagoda, Kabaaye Pagoda, Naga Glass Factory and Bogyoke Scott Market are hightlights to visit in Yangon. Among them, the holiest place of Shwedagon Pagoda is famous not only for being one of our land treasures but also as a place to meet devoted Buddhists at meditation and pray. 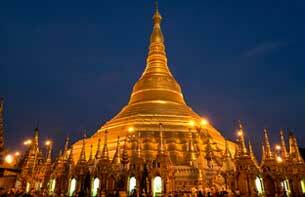 A visit to Yangon is not complete without a visit to the Shwedagon Pagoda. 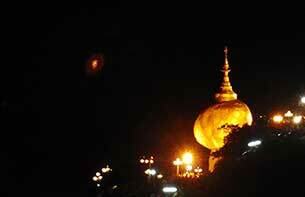 Kyaikhtiyo Pagoda is well known as Golden Rock. 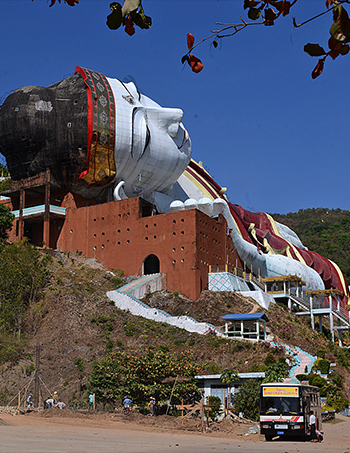 Kyaikhtiyo is the most popular pilgrimage destination in Myanmar and located in Kyaikhto, a small town in Mon state (about 160 km drive from Yangon). A huge boulder on which a gilded stupa was built is incredibly balanced on a high cliff in a deep forest. For many years, the only way of travel was to climb on foot along the steep slopes to the summit, where the Golden Rock is 1100m above sea-level. Nowadays, there is a steep winding road for four-wheel drive cars from the base to the nearest point of the pagoda. All visitors can easily reach the cliff by car and elderly people and disabled people can hire local porter men to carry them up the hill by basket cradle. According to legend, the Buddha’s hair is enshrined in this pagoda. Mandalay, the last royal capital of the BurmeseKingdom, was founded by King Mindon in 1857 and first called Yadanabone. Mandalay is also the second largest city in Myanmar. It is a cultural centre, and you can observe enchanting architecture, wood and stone carvings, silk weaving, ancient tapestry and gold & silver crafts. The main sightseeing highlights are MandalayPalace, surrounded by a beautiful moat; Kuthodaw Pagoda, known as the world’s biggest book of 1774 slabs; Golden Palace Monastery, a superb traditional wooden building; Kyauktawgyi Pagoda and the ctolorful Zegyo Market; full of shopping variety. Panoramic views of Mandalay Hill and Maha Muni Buddha Image show the significance of Buddhism. King Anawrahta founded Bagan in AD 1044. Bagan is situated on the left bank of the famed AyeyarwaddyRiver and is covered with more than 2000 ancient pagodas and temples. Many of the ancient temples and pagodas are sprawled across the wide expanses of green delta plain. 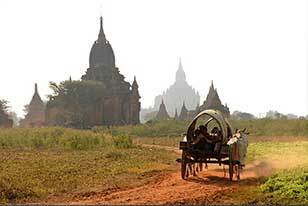 By visiting Bagan, you can know very well the historical, cultural and archaeological of Myanmar. Anyone arriving in this zone is astonished that people had the abilities in ancient times to build such amazing monuments. Nowadays, Bagan is the greatest archaeological site in Southeast Asia and famous for its traditional lacquerware home industry. You should take the time to visit the lacquerware workshop to observe how craftsmen create the unique lacquerware accessories. Inle Lake is located in the heart of the ShanState amid hilly and easily accessible from Yangon, Bagan or Mandalay by Air. The vast picturesque lake, 900 meters above sea-level, is one of the major tourist attractions of Myanmar and famous for its scenic beauty, the unique leg-rowing of Inthas; the native people who are inhabit there and floating gardens, floating market, amazing traditional weaving workshops which can be only seen in this region. 800 years old Phaung DawOo Pagoda, built by King Alaung Sit hu is a mid-lake temple in which lavishly gilded five Buddha images were enshrined and Phaung Daw Oo Pagoda Festival is very spectacular, held in every October. 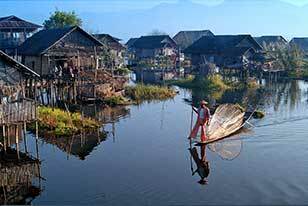 (The end of the Buddhist Lent) Without visiting Inle Lake, your Myanmar trip would be incomplete and meaningless. Mawlamyine (Moulmein) is the capital city of MonState and lies at the mouth of ThanlwinRiver. It is also one of the largest city in the country after Yangon and Mandalay. It is situated 300 km south-east of Yangon and is easily accessible by road or train from Yangon. Places of sightseeing are the Kyaikthalan Pagoda, built in 875 AD, Uzina Pagoda, Shwesandaw Pagoda, Queen Sein Done Monastery, Kyaikkhami mid-water pagoda and Setse Beach. If time permits or you get a chance, you should visit ThanbyuzayatTown (about 34 km), famous for the Allied War Memorial Cemetery where the allied prisoners who died while building the famous “Death Railway” are buried. Hsipaw was once the centre of a small Shan State of its own culture and it is situated in northern Shan State. Visit Haw Nan; Shan Palace which is the northern end of small and beautiful town, Nam Tok water fall which is en-route to famous Bawgyo Pagoda, Chaung-sone (confluent of river) @ water front of the Dohtawaddy river (known as “Silver River”) which passes through the town to join the mighty Ayeyarwaddy River and can observe over (150) years old Shan Monastery and lacquered image of Buddha in Shan village, panoramic scenery of paddy, orange plantations, living style of Shan villagers and trekking to Shan village and Palaung hill tribe Village. Candle Light market can be seen early morning around (4:00) am. ; unique local market and local vendors are selling vegetables, seasonal fruits and other things with lighting candles.As unforgettable experience is very beautiful sunset from private boat through Dohtawaddy River. Once return from Hsipaw to Mandalay, can take train to Nyaung Cho via Gokteik Viaduct, masterpiece of engineering is more than a century old, and your train will slow to a crawl meanwhile crossing to avoid putting undue strain on the structure, afterwards, by overland surface to Mandalay from Nyaung Cho. Kyaing Tong is famous for the trekking program in Myanmar. It is situated in Eastern Shan State and can reach by air from the rest of Myanmar or overland from Thailand via Tacheleik border gate. 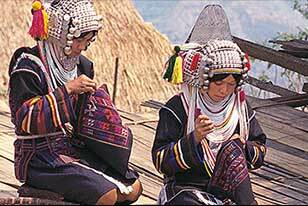 Many hill tribes people are still living at the villages of this city around. When you reach there, you may observe the traditional architecture with the old style houses and the different ethnic minority communities which are Ang, Lahu, Ahka, Akhu, Padaung and much more tribe peoples. So, this scenic town is the best places for the great adventure travellers. Monywa,sits 136 km north-west of Mandalay and is situated on the eastern bank of the Chindwin River in Mandalay division. 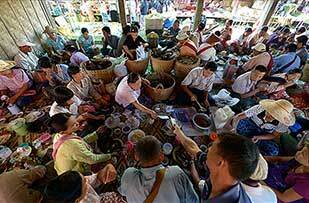 This city is also a major Trade Centre for agricultural produce from the surrounding Chindwin Valley. On the way to Monywa, there is a magnificient and impressive Thaboddhay Pagoda complex with over 500,000 Buddha Images. Other sightseeing places are Amazing Bohi-ta-taung Pagoda (1000 Bo trees), KyaukkaShweguni Pagoda, the Kyaukkalacquerware village and Pho Win Taung Cave, which can be reached by crossing the Chindwin River by ferry boat. You will be able to see Buddha statues, interesting mural paintings and woodcarvings at there. The silence city of Mrauk U; is situated in Western Rakhine State. 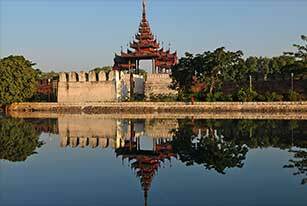 It is also one of Myanmar’s significance Archaeological sites. This ancient capital was founded by Rakhine King Min Saw Mon in 1430 AD. 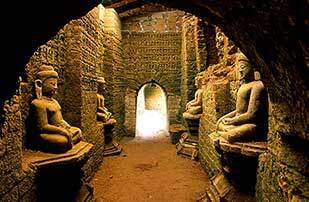 In 16th Century, Mrauk U was the capital of the ancient Arakanese Kingdom and great wealthy as a major trading port with Asia, the Middle East and Europe. Nowadays, this city offers a good chance to observe the culture of Rakhine and archeological site. There are over 700 temples spreading all over with some are ruins and influence by Indian culture. The main highlights are ShitthaungPaya, KoethaungPaya, Htukkanthein and Chin Villages, a local ethnic group known for the women’s tattooed face. This small and picturesque town is located in northern part of Myanmar. People of the Rawan, Lisu, Khamit-Shan, Jing Paw and Kachin are living in peace around this region. Putao is renowned for its Mt. Hkaborazi, the highest icy mountain of South East Asia, ever-green rain forest mountains, crystal white water Rivers, natural biodiversity of Hkaborazi and Phoneganrazi national parks. Red panda, Takin, Apollo butterflies, icy fish, white belly heron and black orchid are the treasures of this city. We would like to highly recommend visit there for mountaineering enthusiasts. It can be reachable all year round by air. Ngapaliis the premier beach destination in Myanmar, given its name, some say, by a homesick Italian, Ngapali. It boasts 3 km of palm-fringed sands on the beautiful Bay of Bengal, this un-spoilt beach is 35 minutes flight from Yangon, is four miles (6.4 km) from the Rakhine State town of Thandwe (Sandoway), turquoise waters deliver a bounty from the sea and this town offers some of the country’s best food. It serves as the best ground for sunbathing and recreation such as beach strolling, cycling and so on. The best time to leisure on the beach is from mid-October to end of April. 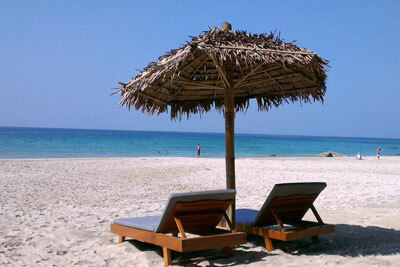 Ngapaliis the premier beach destination in Myanmar, given its name, some say, by a homesick Italian, . It boasts 3 km of palm-fringed sands on the beautiful Bay of Bengal, this un-spoilt beach is 35 minutes flight from Yangon, is four miles (6.4 km) from the Rakhine State town of Thandwe (Sandoway), turquoise waters deliver a bounty from the sea and this town offers some of the country’s best food. It serves as the best ground for sunbathing and recreation such as beach strolling, cycling and so on. The best time to leisure on the beach is from mid-October to end of April.